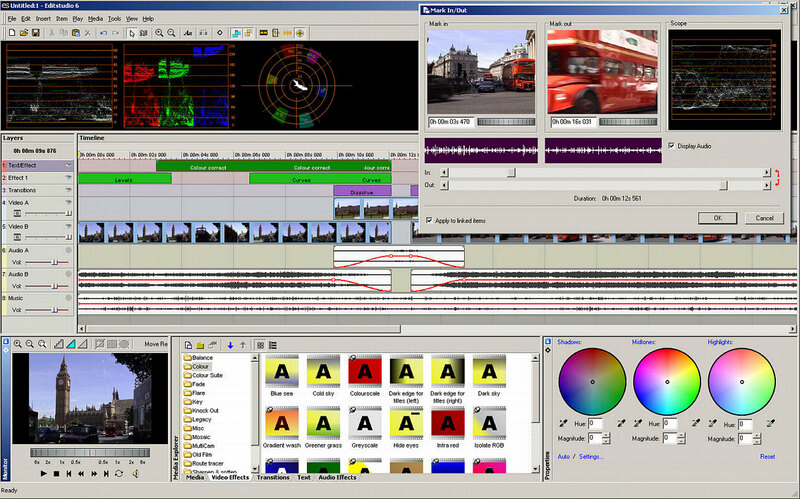 EditStudio is for DV and standard definition editing (NOT HD). It is a full video editing package with standard windows interface, multi-camera support, professional quality tools and results. It is a flexible tool that offers all types of standard and advanced video capturing, editing and Subtitling in one package. There are many video editing applications, but few are both affordable and offers such a strong list of professional features. 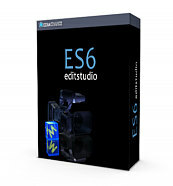 Because of our price policy, EditStudio PRO is very affordable. 30. Nov 2012 - Due to the expiration of license between Mediachance and Rovi corp the new owner of Mainconcept MPEG2 engine, Edit Studio 6 installation no longer contains Mainconcept MPEG2 libraries. From this date the price of EditStudio had been permanently cut and remains an excellent and inexpensive choice for DV and AVI codec based editing with multiple camera support. Note: installing the free K-Lite Codec Pack Basic enables import and expert of many video formats through Direct Show. If you own previous Edit Studio and need download the MPEG2 libraries, you can do from this link. You will soon discover one of the EditStudio strongest feature - the unlimited stackable effects and transition layers. Instead of applying the effect directly to a video track, you can use the effect tracks instead. This makes handling the project much easier and much more visually oriented than in other applications. It is easy to position the effect to the exact frames without splicing the video. 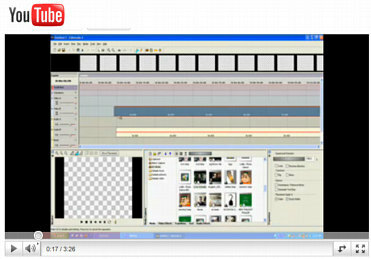 It is easy to move the effects or resize them in timeline or even copy and paste them without touching the video tracks! Thanks to the EditStudio unique layered Effects, multi-camera editing uses very clean approach. No splicing and dicing of your videos. The switching between different cameras is done right on the Effect layer, without actually touching any of your synchronized videos. And adding transitions between the cameras is equally simple, just add it over the cut on the Transition Layer! Adding frame accurate subtitles using subtitle Marks is now much easier with EditStudio PRO. You have the benefit of hearing and seeing the exact scene and the audio. The subtitles are also displayed on the Preview monitor during playback, making it easy to evaluate the timing. Then at the end you will just export them as *.SUB files that you can use in DVD-lab PRO or other professional DVD authoring application. You will be surprised to find many professional tools such as Vectorscope, Waveform, RGB Parade, Tone and Bar generators, IRE safe Colors, 3-point Color correction, Chroma/Luma-key, Quick Matte etc. You can trim items directly on timeline with support for slip editing, to retain the items running time. Interactively adjust audio volume, balance and pan via rubber bands. Version 6 adds easy J and L cuts for linked items. Motion paths can include mixture of linear and spline curves. Objects can be moved and resized by dragging with the mouse or entering coordinate values for accurate placement with instant feedback. There are not many other applications that come already with such a great variety of pro-grade effects. Chroma Key, Luma Key, Realistic Old Film effect, Flare, Color and Gradient filters, Route Tracer for animated routes or graphs, Knock Out for removing on-screen text or graphics and much more. Effects can be applied also only to a circular or rectangular region of frame. For example you can blur out a face of a person and then keyframe the blur region to move with the person. There are also many user customizable transitions, over 100 transitions are provided, more available through Herb Garden. Here we go to the area where only true professional packages will let you. 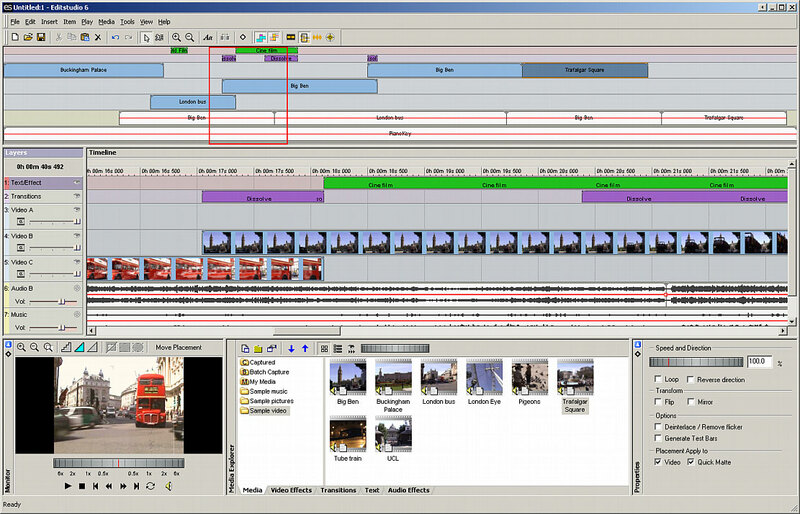 You can set key-frames for frame (video, image) placement, audio and many effects, then edit key-frames directly on the timeline. Linear, step and spline interpolation types are supported, along with ease in / out acceleration. 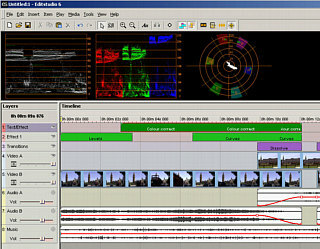 EditStudio has integrated analogue and DV capture with automatic scene detection using optical or DV timestamp methods. Also you can preview directly into DV device. This is a 30-day fully functional Trial version. 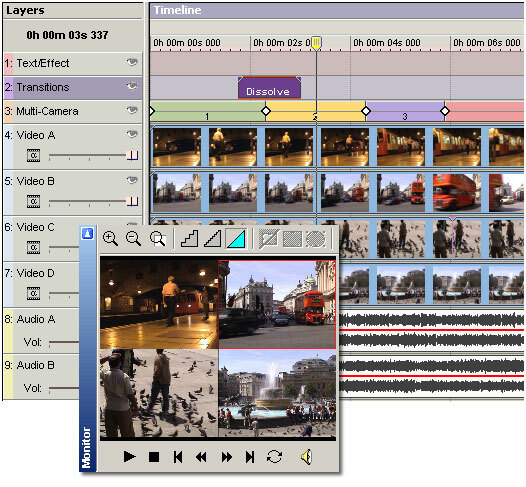 EditStudio 6 has direct support for editing multi-camera footage. It uses some of the unique properties where the effect (here the multi-camera switching) is applied in its own track and it never touches the underlying videos. User video, tutorial for split screen/matte paint. Also good to see the basic ES workflow. 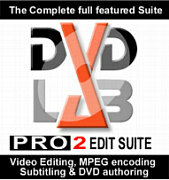 Check out the suite that includes DVD-lab PRO2 and EditStudio in one bundle.